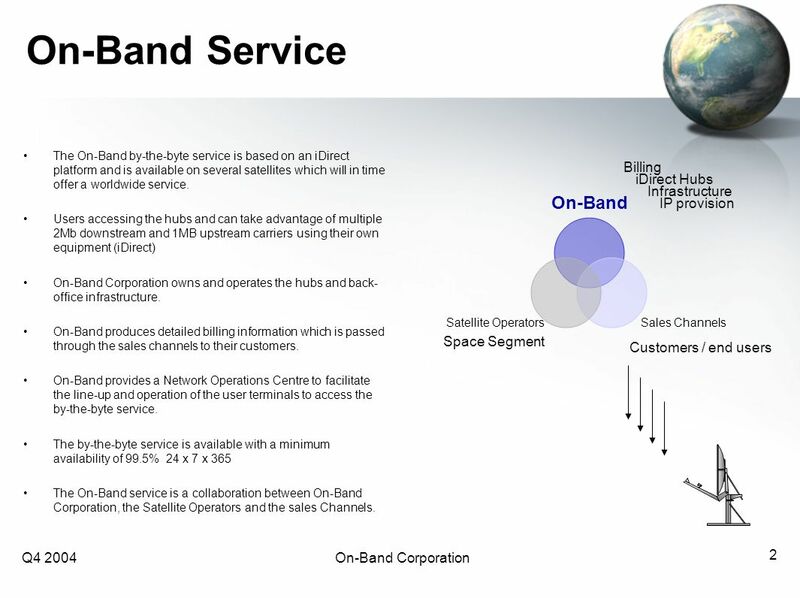 Q4 2004On-Band Corporation 1 Satellite On-Demand Global IP Broadband Reseller/Service Overview. 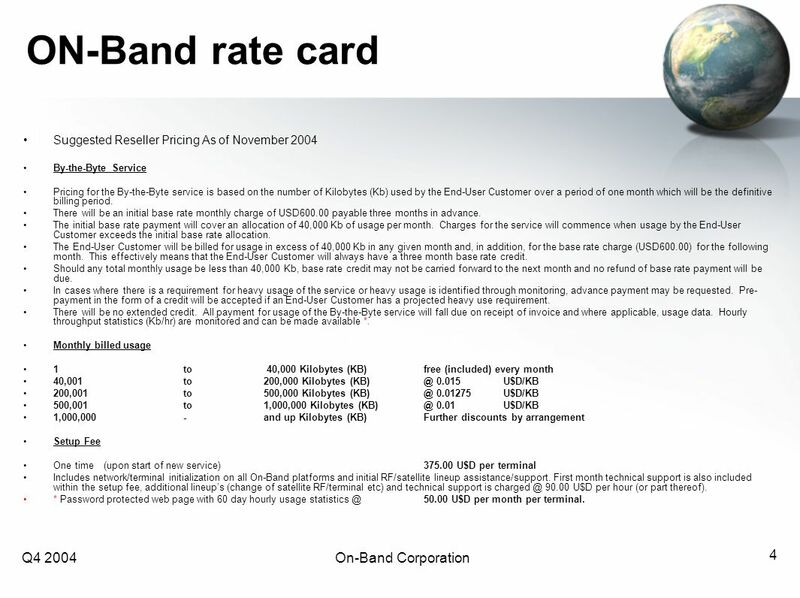 4 Q4 2004On-Band Corporation 4 ON-Band rate card Suggested Reseller Pricing As of November 2004 By-the-Byte Service Pricing for the By-the-Byte service is based on the number of Kilobytes (Kb) used by the End-User Customer over a period of one month which will be the definitive billing period. There will be an initial base rate monthly charge of USD600.00 payable three months in advance. The initial base rate payment will cover an allocation of 40,000 Kb of usage per month. Charges for the service will commence when usage by the End-User Customer exceeds the initial base rate allocation. The End-User Customer will be billed for usage in excess of 40,000 Kb in any given month and, in addition, for the base rate charge (USD600.00) for the following month. This effectively means that the End-User Customer will always have a three month base rate credit. Should any total monthly usage be less than 40,000 Kb, base rate credit may not be carried forward to the next month and no refund of base rate payment will be due. In cases where there is a requirement for heavy usage of the service or heavy usage is identified through monitoring, advance payment may be requested. Pre- payment in the form of a credit will be accepted if an End-User Customer has a projected heavy use requirement. There will be no extended credit. All payment for usage of the By-the-Byte service will fall due on receipt of invoice and where applicable, usage data. Hourly throughput statistics (Kb/hr) are monitored and can be made available *. Monthly billed usage 1to 40,000 Kilobytes (KB)free (included) every month 40,001to200,000 Kilobytes (KB)@ 0.015U$D/KB 200,001to 500,000 Kilobytes (KB)@ 0.01275U$D/KB 500,001to1,000,000 Kilobytes (KB)@ 0.01U$D/KB 1,000,000 -and up Kilobytes (KB)Further discounts by arrangement Setup Fee One time(upon start of new service)375.00 U$D per terminal Includes network/terminal initialization on all On-Band platforms and initial RF/satellite lineup assistance/support. First month technical support is also included within the setup fee, additional lineup’s (change of satellite RF/terminal etc) and technical support is charged @ 90.00 U$D per hour (or part thereof). * Password protected web page with 60 day hourly usage statistics @ 50.00 U$D per month per terminal. 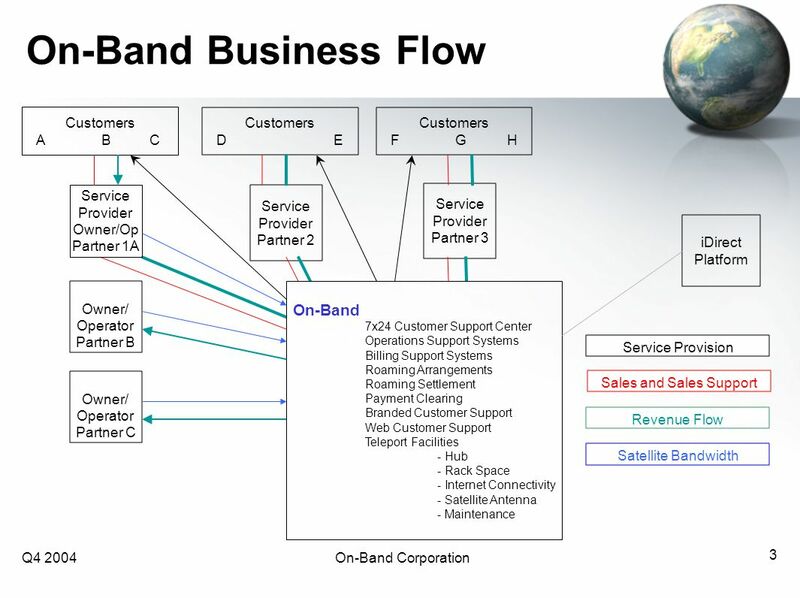 Download ppt "Q4 2004On-Band Corporation 1 Satellite On-Demand Global IP Broadband Reseller/Service Overview." Joe SimonettiT-FLEx Workshop T-FLEx October Workshop The Future of Fare Collection Bank Card Transactions & Merchant Processing Joseph Simonetti October. Our solution best in class quality of service Hubbing Premium Full IP service provides carrier-grade quality of service with minimum transcoding on call. Trevor Hudson. Agenda Overview What & How Benefits for LARS Benefits for Microsoft Customers LAR 101 Promotion Further information. Our solution This solution is available on Orange’s seamless network in TDM or IP: a single interconnection gives you access to all our destinations. an. FCC Satellite Forum March 21, 2005 Mobile Broadband Solutions Robert Hanson Vice President - Regulatory Affairs. XCALLIBRE Partnership Models. Challenge Challenge: How to… Prevent price and value erosion in the market, Increase brand strength & awareness, Increase. Q-CallShop Complete VoIP-based Call Shop Solution/Service provided on an ASP model to facilitate the building and to. Technical Policy and Standards Andy Gorton – Senior Architect: Institutional Networks. 2014 Asia-Pacific Financial Forum Seattle, Washington July 7, 2014 Electronic Payments: Expanding Financial Access for Consumers and Businesses of Every. Integrating Oracle iSupport into Online Customer Service Portal for RMA January 17, 2007 Presented by: Craig Vidal Anant Soni. Market Research on Global Mobile Robots Industry Trends Survey and Opportunities Report Published: Aug 2015 Single User License: US $2800 Corporate. Market Research on Global Tissue Paper Industry Trends Survey and Opportunities Report Published: Apr 2015 Single User License: US $2600 Corporate. Market Research on Global 3D Printing of Metals Industry Trends Survey and Opportunities Report Published: Nov 2015 Single User License: US $2800. Market Research on Global Biomass Boiler Industry Trends Survey and Opportunities Report Published: Nov 2015 Single User License: US $2800 Corporate. Market Research on Global Food Preservative Industry Trends Survey and Opportunities Report Published: Nov 2015 Single User License: US $2800. Market Research on 2016-2021 Silver Industry Trends Analysis Report Published: Jan 2016 Single User License: US $2800 Corporate User License: US $5600.